← What Do You Want to Hear First: Good News or Bad News? The question as to whether corporate culture has an effect on financial performance has been asked before and it will likely be asked again. In a study published in the Cornell Hospitality Quarterly, research demonstrated a link between corporate culture and financial performance. However, not all corporate cultures are created equal. Some corporate cultures had a positive effect, some had no effect, and some even had a negative effect. Market – (External, Controlled) – Tend to be results-oriented, with a focus on competition. 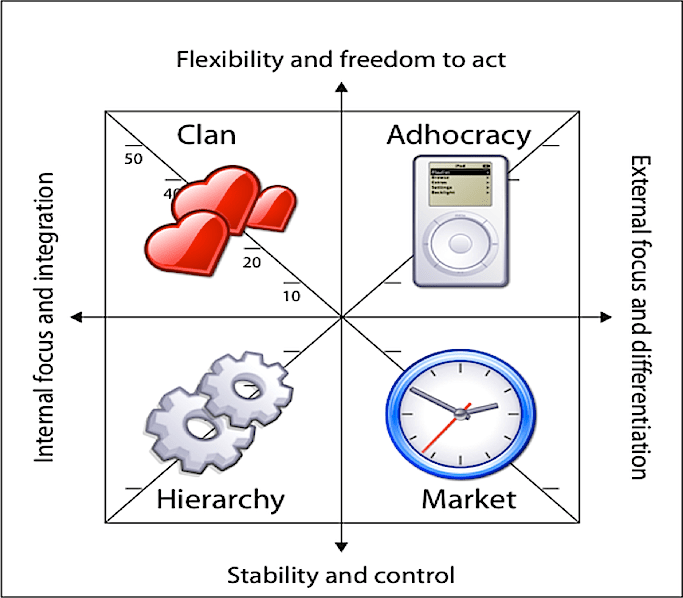 Adhocracy – (External, Flexible) – Tend to be dynamic and entrepreneurial, with a focus on innovation. Clan – (Internal, Flexible) – Tend to be family-like, with a focus on mentoring. Hierarchy – (Internal, Controlled) – Tend to be structured and formalized, with a focus on efficiency. Market – no significant effect on financial performance. Adhocracy – positive effect on financial performance. Clan – positive effect on financial performance. Hierarchy – negative effect on financial performance. Some of the strategic orientations have obvious clashes with corporate culture. For instance, a Hierarchy culture would be ill-advised to try and implement a Leading strategic orientation. Likewise, we wouldn’t expect an Adhocracy culture to successfully implement a Conservative strategic orientation. The research found that Clan, Adhocracy, and Hierarchical cultures could improve their financial performance if the adopted a Leading or Defensive strategic orientation. The one finding that I found interesting had to do with the Aggressive strategic orientation. The researcher found that this strategic orientation didn’t have a significant impact on any of the culture’s financial performance. Meaning, undercutting a competitor in an effort to gain market share was not an optimal strategy for any of the corporate cultures. Of course, as stated earlier, this study was only conducted on Korean hotels, but it would be very interesting to see if this particular finding help up when studying hotels in a different part of the world. Moreover, I’d be interested to see if this finding would also remain true across industries. That is, some folks think that competing on price is the way to go (Hi Walmart! ), so if this study’s findings can be replicated in another industry, it might have an effect on the way that some firms compete. In particular, it might dissuade some from competing on price. This entry was posted in Business, Research Blogging and tagged Adhocracy, Adhocracy Culture, Clan Culture, Cornell Hospitality Quarterly, Corporate Culture, Corporate Strategy, Culture, Financial Performance, Hierarchy Culture, Hospitality Industry, Market Culture, Strategic Orientation, Strategy. Bookmark the permalink.